LONDON--(BUSINESS WIRE)--BizVibe, a smart B2B networking platform for global B2B buyers and suppliers, announced today the next generation of its B2B networking platform for the top soap manufacturers in the USA. With the update, businesses can establish a faster and more efficient path from company discovery to getting better quotes and building long-lasting profitable business partnerships with the leading soap manufacturers in the USA. Soap has long been one of the most common products in the global Fast-Moving Consumer Goods (FMCG) sector. Today, soap is still one of the most used cleansing items in every household around the world, leading to a huge demand increase in the global household market. The USA has maintained its leading position in the global soap market in terms of soap manufacturing and soap exports. Many major soap manufacturers from the USA are also some of the largest soap suppliers or top soap exporters in the global market. As the global demand for soap products — such as liquid soap, organic soap, and handmade soap — continues to grow, the USA’s soap industry is expected to flourish further in the near future. BizVibe’s latest update connects businesses to the top soap producers, suppliers, and exporters in the USA and helps users discover thousands of opportunities daily. BizVibe has innovated the modern networking platform to make your sourcing process faster, smarter and hassle-free. Connect and network with the USA’s leading soap companies on BizVibe now, and help your business grow to another level! Why Connect with Companies from the USA’s Soap Industry? The global soap market is generating huge demand, driven by growing population, increasing health awareness and rising levels of hygiene among consumers worldwide. The latest soap industry report shows that the global soap market totaled a value of US$ 18 Billion in 2016 and the figure is expected to reach US$ 24 Billion by 2022. The USA is one of the world’s largest soap markets and soap exporters in the world, generating over $25 billion revenues annually. In 2016, the USA exported over US$ 923.4 thousand worth of soap products, representing nearly 10% of the world’s total soap exports in that year, making the USA the world’s second largest soap exporter. Most of the USA’s soap products are shipped to its neighboring countries including Canada and Mexico while emerging markets in Asia — such as China, Japan, and South Korea — are some of the largest importers for soaps from the USA. Since global soap demand continues to surge, the USA’s production and export of soap products are expected to grow further over the next few years, and so do the business opportunities in the USA’s soap market. 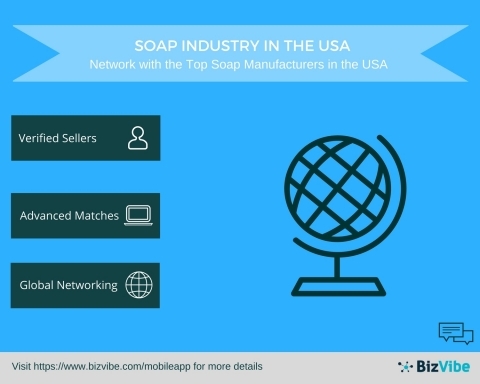 Not only does BizVibe’s networking platform introduce businesses to verified soap manufacturers in the USA, the intelligent B2B networking platform also connects global trade professionals with over 7 million prospecting and sourcing candidates in over 700+ industries. BizVibe cuts research time, allowing you to go after the real opportunities. BizVibe connects like-minded buyers and suppliers to help companies keep up with the market demand. Join for free today to find your next big opportunity in a community of leading soap manufacturers in the USA.